Photography on the Run - Page 188 of 192 - Images taken on trail runs, and other adventures, in the Open Space and Wilderness areas of California, and beyond. All content, including photography, is Copyright © 2006-2019 Gary Valle. All Rights Reserved. Update May 21, 2009. Angeles Crest Highway (SR2) has since been re-opened to Islip Saddle, and through to Wrightwood. There’s more of a wilderness feel in the Angeles Forest high country today. A big chunk of Angeles Crest Highway is closed. From Eagles Roost to Mt. Baden-Powell, and back again, the absence of vehicle noise has been startling. There have been no squealing tires, warbling sirens, or red-lined RC51’s echoing up from Highway 2. Instead, the loudest sound is Little Jimmy spring water splashing at my feet. High on a ridge, a Clark’s Nutcracker tells me I’m in the mountains. and overhead, the wind plays quietly in the boughs of an immense Incense Cedar. It’s been a blazing, triple digit day down in the valleys, and even at 8000 ft. the south-facing slopes have been warm. Chased by the warm weather, several PCTers trek northward; hoping that by the time they get to the Sierra the passes will not be choked with snow. Most have seemed enthusiastic, and eager to face the challenges ahead. The crux of this day’s adventure looms around the corner at Islip Saddle. The steep 1.5 mile climb to near the summit of Mt. Williamson, and 1.5 mile descent to Hwy. 2 will retrace earlier miles of my trek. A mirror image of this morning’s pleasant ascent, this afternoon’s climb will be a cruel and evil twin. The 1200 ft. elevation gain will bring the day’s total to around 7000 ft.
Today’s photograph is of a nice downhill section of trail at about 8200 ft, northbound on the PCT, above Windy Gap. That’s Mt. Williamson in the background. I was surprised I didn’t run into anyone that was doing Mt. Williamson. Williamson Rock is in the area closed by the Forest Service to protect critical habitat of the mountain yellow-legged frog, but Mt. Williamson is outside of the closed area (PDF Map). The Hwy 2 closure is about 0.25 mile west of Eagles Roost, and only adds about 2 scenic miles to the round trip up Williamson. If your favorite hikes or runs start at Islip Saddle, here’s a topo map of the area that shows the approximate mileages from the locked gate on Hwy 2 to Islip Saddle. For more information regarding the closure of Williamson Rock, see the Access Fund Williamson Rock page for more information. 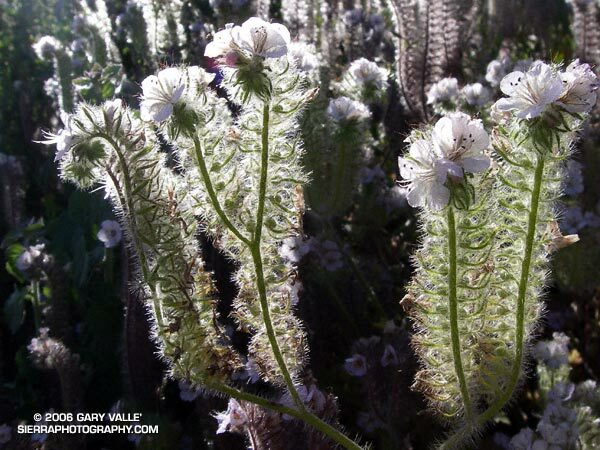 Caterpillar Phacelia (Phacelia cicutaria) was prevalent at Sage Ranch prior to the 2005 Topanga Fire. It may be somewhat more widespread than I’ve generally seen, but this could be due in part to last year’s record rainfall and this season’s late rainfall. It doesn’t appear to be a fire follower in the same sense as Large Flowered Phacelia, Star Lily or Dicentra, whose populations have increased dramatically this year. 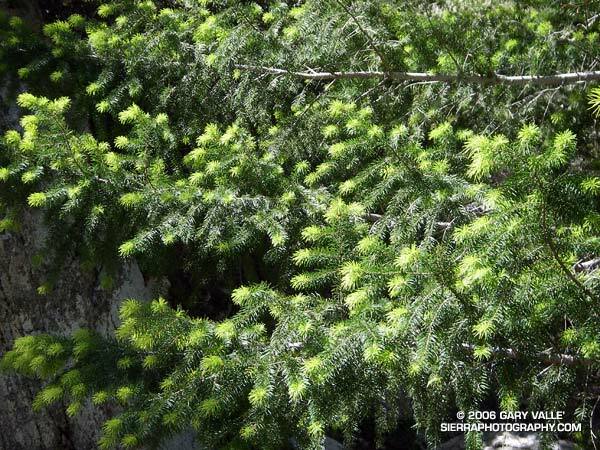 Bright green highlights new growth on a Big Cone Douglas Fir (Pseudotsuga macrocarpa) in the San Gabriel Mountains near Josephine Peak and Strawberry Peak. These peaks are popular lower elevation summits, that can be snow-free in Winter, or a blast furnace in Summer. Josephine Peak (5558 ft.) was once the site of fire lookout, and a fire road leads from Clear Creek Station to its summit. From the west, via Clear Creek or Colby Canyon, Strawberry Peak (6164 ft.) is a more difficult ascent that requires careful route-finding and rudimentary rock climbing skills. Many hikers prefer to do Strawberry from the east, starting at Red Box. 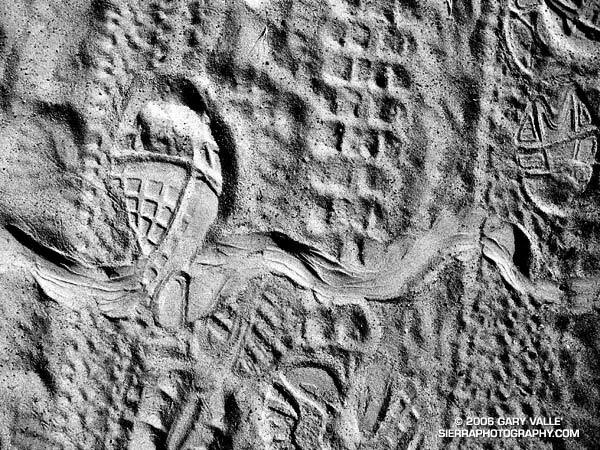 The day this photograph was taken, I wasn’t climbing Strawberry Peak, but instead was running a circuit around the peak. 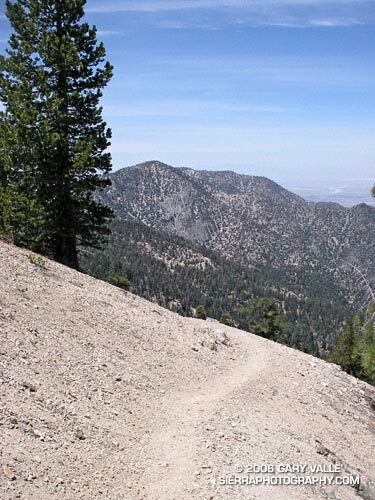 Part of the Angeles National Forest Trail Race course, the circuit is an excellent 15 mile loop with an elevation gain/loss of about 2700 ft. Here’s a Google Earth image and Google Earth KMZ file of a GPS trace of the Strawberry Peak Circuit. A longer variant of this route is described in Fall Leaves on Bear Creek and Strawberry – Bear Canyon Loop. 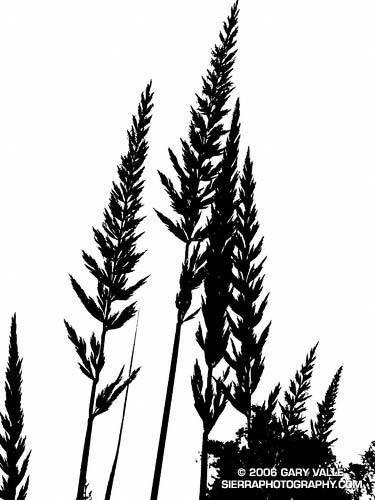 Giant Rye Grass (Leymus condensatus) is a member of the grass family that can grow several feet tall. These, out at Sage Ranch, are in the 5-7 ft. range. Practically any objective can make a good excuse for an adventure. Each time up or down the Chumash Trail, I pondered the prominent rock formation northwest of the trail, and wondered what I might find there. My first thought was to find a direct route across the deep canyon that parallels the Chumash Trail. Recons from a couple of points on the trail revealed that the this was a bad idea. Sections of the canyon that looked passable from above were incised, with crumbling, near-vertical walls. A Plan B was required. A look at a topo map suggested it might be possible to access the ridge on which the formation was located from Las Llajas Canyon. An advantage of this approach was that, if it worked, it would be part of a loop. A cool January morning, I decided to give it a go. From Las Llajas Canyon, an old overgrown roadbed led up a side canyon to a point where there was no obvious route. The canyon bottom did not look promising, and steep slopes bounded both sides of the canyon. After scrambling several hundred feet up a south-facing slope, I found a deer trail that seemed headed in the general direction I wanted to go. This game trail was the key. Its route reflected the cumulative experience of deer in dealing with the terrain issues I faced. It turned out to be remarkably efficient, and appeared to represent the path of least energy needed to reach the main ridge. That is, if you’re a deer. At one point I was forced to backtrack and climb above the trail when it crossed a steep, exposed slope better suited to those with four legs and cervid hooves. Once up on the main ridge, it didn’t take long to reach the rock formation. According to the Dibblee geological map of the area, the formation is positioned on the south branch of the Simi Fault. The steeply inclined beds of river cobble seen in this photo might have been deposited as part of a fan delta some 60 million years ago. This Paleocene age cobble is also encountered at several places along the Chumash Trail. Near the summit of the formation some chiseled inscriptions were found. They were very weathered. The most prominent might be either a “93” or “33” over the top of a “W,” and another is perhaps a “DH.” It’s hard to tell. Of the three high points comprising the formation, I scrambled to the top of two. 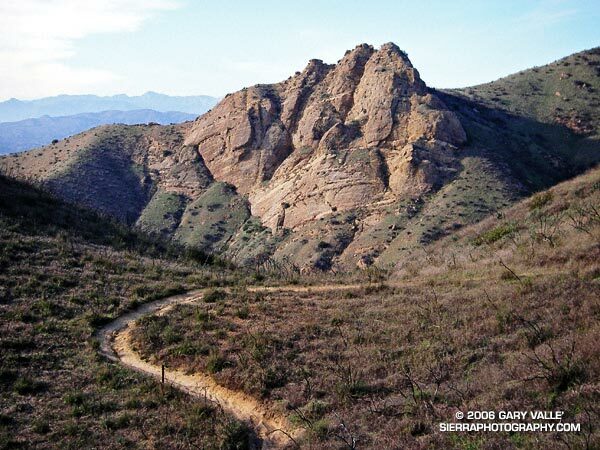 The eastern-most summit (on the far right when viewed from the Chumash Trail) is wholly comprised of cobble and looked like an accident waiting to happen. Here’s a photo from near the summit of the formation, looking back down the ridge. As I climbed down from the summit to a saddle northeast of the rock formation, I spooked a deer and it bounded into a brush filled gully. Continuing up the ridge, it eventually intersected Rocky Peak Rd. at its high point near some bivalve fossil beds. According to the Dibblee map, these are much younger than the rock formation’s river cobble, and may have been deposited in shallow marine conditions or lagoons a couple million years ago. Runners, mountain bikers, a hiker, a rattlesnake, a wind-blown grass seed, and a motorcycle — all up on Laskey Mesa in Upper Las Virgenes Canyon Open Space Preserve (formerly Ahmanson Ranch).